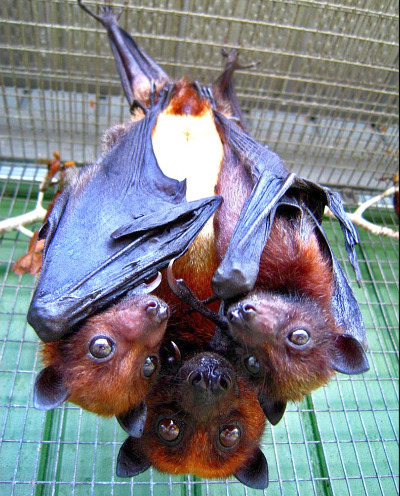 Rare Variable Flying Fox pup twins with mom. ... and what better time to profess my love of bats. I rather love bats. I always have. They have wonderfully expressive faces and eat their weight in pest-y insects. If only we could find a way to vaccinate them against rabies, I would let them live in the house. OK, I would let them live in the barn. Twinning is very unusual in the bat population so when 0.1 Variable Flying Fox “Charisma” gave birth to her boy and girl there was much excitement and more excitement when she raised them both. No word as to names. Love the photo of the bat family. I too am an admirer, but the unfortunate fruit bats or flying foxes over this way (Queensland Australia) are getting a lot of bad press lately. We don't have rabies here, but the equally nasty Hendra virus, and, after several outbreaks, there are some who would happily nuke every bat colony into oblivion. Let's hope cooler heads prevail. happy Halloween. No way they look so adorable to be true! excellent picture sweety!